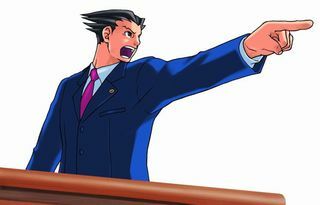 Of course you've played "Phoenix Wright: Ace Attorney," the most exciting lawyer video game ever. But have you seen the musical version? Specifically, have you seen the musical version performed by the all-female cast of the Takarazuka Revue? Takarazuka is Japan's answer to the Ziegfeld Follies, the Folies-Bergere, Las Vegas floor shows, and the [Radio City] Music Hall's own spectaculars all rolled into one glittering unwieldy package [said the NYT's theater critic]. There is something intrinsically awesome in the sight of rows of showgirls, decked out like floats, descending a grand staircase in formation. 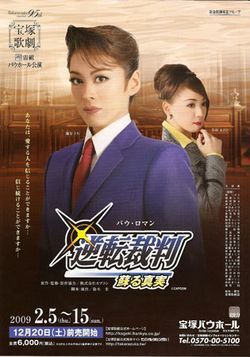 Not sure how they work that sort of thing into a musical based on a video game about Japanese lawyers, but I have no doubt it's intrinsically awesome. This was performed back in 2009, but maybe there'll be a revival. You can still get the DVD (shown above), or there is what looks like sort of a highlights clip here on YouTube. I have no idea at all what's going on in these clips, but they're entertainingly odd.